For some reason I am misjudging the buzz about this movie, so hopefully I can stir some up right here. We heard they were doing a sneak this weekend so we hurried down to the theater and bought tickets. We showed up early and then we sat in the empty theater. It got kinda full, but not nearly as full as I expected, I figured it would sell out. Maybe everyone is not as into the previews as I am but I thought the movie looked awesome, so we went as soon as we could. 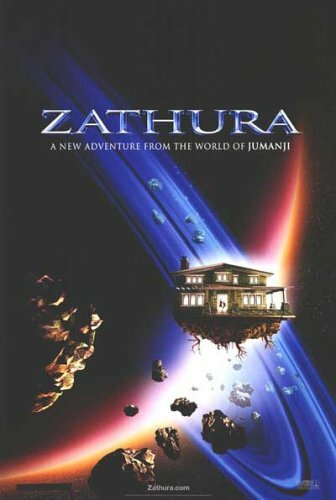 So Zathura, or Jumanji in space, was a fun adventure movie that is solidly done throughout. It was fun, scary, action packed, good special effects, fun story, neat idea, and I felt was cooler than Jumanji…I have very little to say against the movie. Tim Robbins was in it, so that makes it cool automatically. I laughed out loud in some parts. I jumped. I was scared. I watched in amazement and fun. I was really into it. The only issue I had was one of the two brothers sounded like he was gonna cry everytime he talked, it was really annoying, but it wasn't enough to give this movie a bad review. I think this movie is worth the rental for sure and maybe even a trip to the theater, I do have to warn there were a lot of kids in our audience, so I would expect them to be in yours too. They were quite good in our theater, so I am assuming they were having a good time as well, I didn't even notice a single one being out of hand. So this movie might be a good one to check out, before Potter comes out on the 18th. And if you like the movie, you can now buy the game!